In this resource I gave a detailed explanation about how a nerve impulse will be conducted in a nerve fib-re by Sodium pump theory. The other things I mentioned in this resource is how neurons transmit impulses between one to the other through synapses and neurotransmitters. I also gave an account of how nerves are formed and the different type of nerves present in human body. How a nerve impulse will be conducted in a nerve fib-re? In a resting condition, the outer surface of a nerve fib-re carries positive charges (Na+ ions) but the inner surface of nerve fib-re carries negative charges. This condition of the nerve fib-re is said to be Polarized state. When the nerve fib-re get stimulated, the positive Na+ ions move inwards through Axon membrane and the negative ions move outwards at the excited spot. Due this, at the excited region depolarization occurs. The point of depolarization now becomes stimulus for the next neighboring area of the Axon membrane which in turn becomes depolarized. Meanwhile the previous area which is depolarized before becomes re-polarized due to active transport of positive Na+ ions to outside. The conduction of impulse along axon membrane is achieved by "Sodium Pump" by spending energy through ATP. Conduction of nerve impulse along a nerve fib-re is wave of depolarization followed by re-polarization. 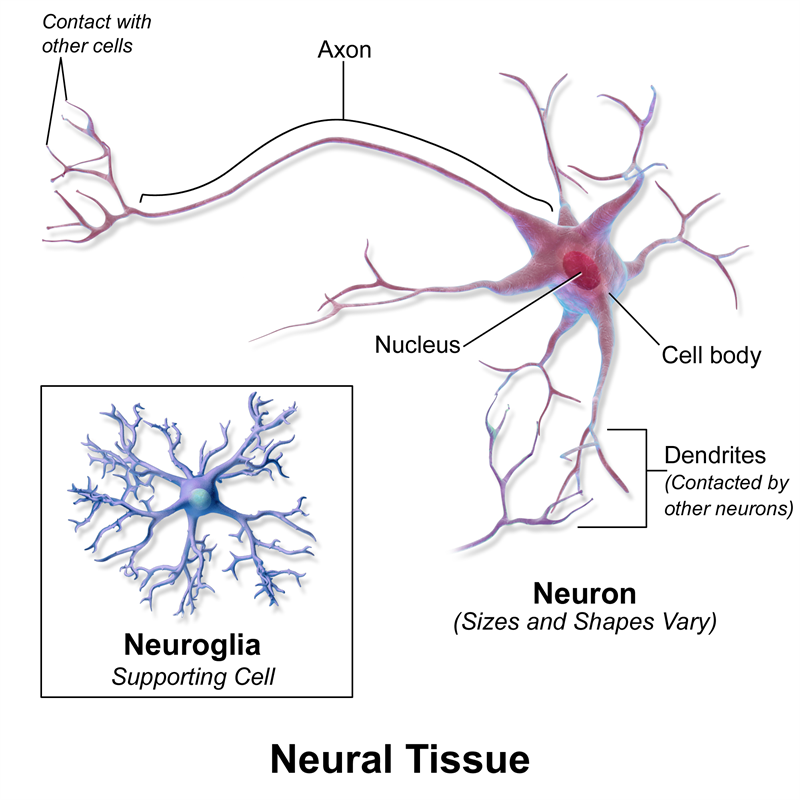 You can go through to know about a related topicWhat is the structure of a Neuron or Nerve Cell ? (Part-1) from here. How impulses will be conducted from one neuron to the other? Neurons in the nervous system are arranged in the form of a long chains where impulses from one neuron are carried to the next neuron through synapses and neurotransmitters. The dendrites of the Cyton end of the neuron are known as afferent dendrites and the dendrites of Axon end are known as efferent dendrites. Impulses in a neuron are carried from Cyton end of the neuron to the Axon end of the neuron. 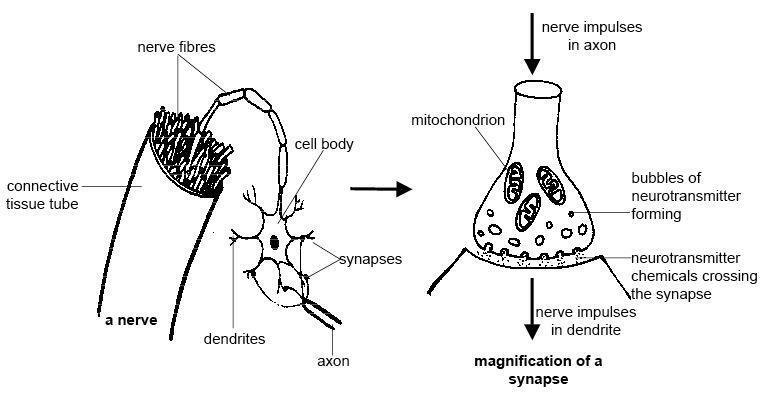 The efferent dendrites of the first neuron are always make a contact with afferent dendrites of the second neuron. The point of contact between two neurons is known as Synapse.When two neurons contact at a particular point a small gap is left between the neurons is known as Synaptic cleft. When the impulse in the first neuron reaches the branched Axon end of the neuron, then the impulse will be transmitted to the next neuron through chemical messenger Acetylcholine released into the synaptic cleft region of two neurons. This chemical sets a new impulse in the dendrites of next neuron. The chemical is soon broken down by an enzyme to make synapse to receive the next impulse. Nerve is a bundle of nerve fib-res or Axons of separate neurons covered over by a protective tubular sheath. We can compare a nerve to a electric cable where many electric wires conduct electricity but separated from each other by an insulating plastic covering. Similarly the nerve fib-res or Axons are covered by an insulating myelin sheath which prevent the mixing of impulses. Sensory Nerves : Sensory nerves are composed of sensory nerve fib-res only. Sensory nerves carry impulses from the receptors i.e. sensory organs to brain or Spinal cord. Example:-Optic nerve arise in the eye and end in brain. Similarly, auditory nerve start in the ear and end in brain. Motor Nerves : Motor nerves are composed of motor nerve fib-res only. Motor nerves carry impulses from brain or Spinal cord to effector organs i.e. muscle or glands. Example: A nerve which arise from the brain will be connected to the muscles of eye for rotating eye ball. Mixed Nerve : Mixed nerves are composed of both motor nerve fib-res and sensory nerve fib-res. Mixed nerves carry impulses from Central Nervous System (Brain or Spinal cord) to the body and carry impulses from body organs to the Central Nervous System. Example:- 31 pairs of Spinal nerves are Mixed nerves only which include both sensory nerve fib-res and motor nerve fib-res.